A wreath of palms and poppies thirty feet in circumference and weighing almost 1,500 pounds was placed on the crown of the Goddess of Liberty in New York Harbor on May 29 by World War and Spanish-American War Veterans in memory of members of the merchant marine who died for their country. The wreath was of such huge proportions that it had to be taken to the island in sections. There it was put together in time for the ceremony. A delegation of about twenty-five men, many of them disabled and members of the United American War Veterans, sailed to the island on the United States Shipping Board tug "Active" and hoisted the wreath to the top of the statue. It was planned to keep it there for a week, at the end of which time the flowers, palms and ferns that compose it will be strewn upon the waters of the bay. Similar exercises will take place annually hereafter at the statue. No fitting place could be chosen for honoring the memory of those who gave to their country the "last full measure of devotion" Additional text describing event below picture. 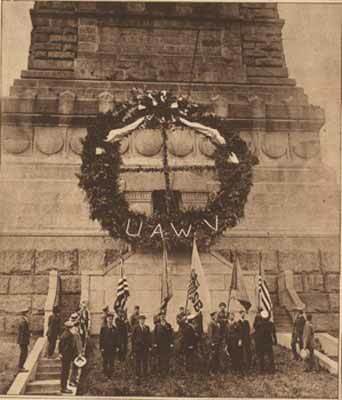 One of the largest wreaths that was ever created was placed on the crown of the Statue of the Goddess of Liberty on Bedloe's Island, New York, by the United American War Veterans on Sunday May 29. The wreath weighed three-quarters of a ton, and was nearly ten feet in diameter. It was placed there in honor of the fallen members of the merchant marine. It is here seen at the base prior to being hoisted to the top.